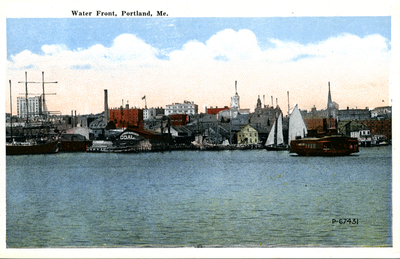 View of downtown Portland piers, from water, circa 1920. Fidelity Trust Building in background, left. Coal pier at center, left. Casco Bay ferry at right. Published by The Eastern News Company, Portland, Me. "Water Front, Portland, Me." (2013). Portland Postcards. 23.